Commission a pet portrait Via my shop on Etsy you can order customized pet portraits. Since I began drawing pets in 2014, I’ve received some lovely reviews, which is great confirmation that the feeling is mutual because I LOVE drawing animals! Nice words: "Absolutely delighted with this wonderful portrait of a much loved old companion. Margit is brilliant- highly recommended." "Margit is a gifted artist and wonderful to work with. I commissioned a double portrait of my daughter and our dog as a gift for my husband. She responded quickly and recommended an ink with watercolor wash. The results are amazing! She took the photograph I'd sent, made the few changes I'd requested, and I had the finished result (shipped overseas) in less than a month. This work of art is the highlight of our art collection, for both sentimental reasons and the beauty of it. Highly recommend!!!" 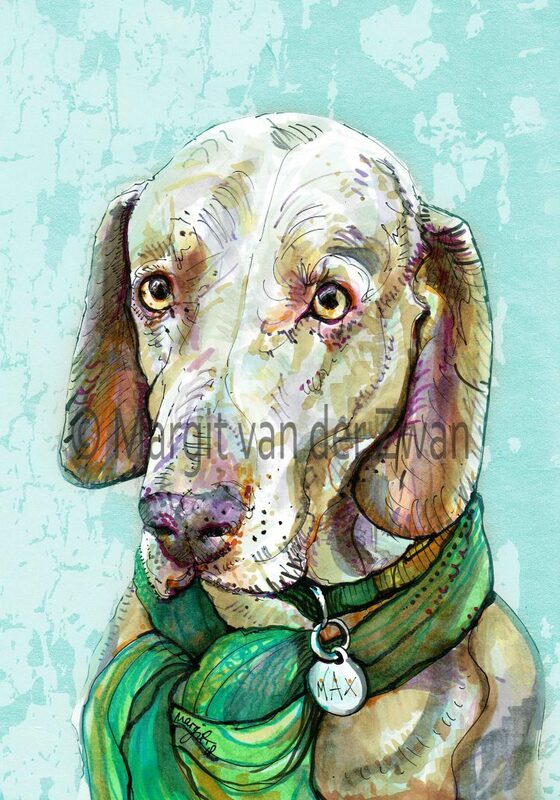 "Margit sent us two fantastic portraits of our dog Willow. We love them. Margit was a joy to communicate with and we didn't have to wait very long for the order. Highly recommended!!! 5 stars!!" "This was a present for my mum and she absolutely loves it. Margit captured my budgie perfectly! Great communication and fast delivery. Would definitely purchase again." "A terrific artist that was able to turn around the unique commission in just a few days. The illustrative style captured the likeness and life of my cat perfectly. Looking at the illustration gives me pleasure every day!" Hey! I do the pirouettes around here! Ball, Must chase the ball...Ooo a squirrel! You're a jolly good egg. Something something dark side, something something complete! But WHY can't I go on the settee? Ha ha, they've gone out. Time to snuggle up on a bed! Ha ha, they've gone out. SOFA TIME! Flo comes out with some astonishingly inaccurate facts. Lady Bunty Bountiful at her Escritoire. Animal portrait commission also for sale. But WHY can't I lie on the sofa?